Thailand has mobilised about 40,000 security personnel ahead of rallies by "red shirt" opposition protesters over the coming days. The demonstrators plan to meet around the country before converging on the capital, Bangkok, by Sunday. They are mainly supporters of former Prime Minister Thaksin Shinawatra, who was ousted in a military coup in 2006. They say they plan to rally until Prime Minister Abhisit Vejjajiva calls new elections. Thailand's red shirted anti-government protesters are gathering in several provinces and starting to travel to Bangkok. Some tens of thousands are expected to reach the capital late on Saturday - certainly few are visible so far. Ceremonies have been held at several spots around the city, but red shirts say they will now disperse until Sunday. Small groups of men in camouflage - part of a planned large security presence - can be seen on a few street corners. But the capital is peaceful, going about normal business. The red shirts' leaders insist their protest will be peaceful, in contrast to the riots almost a year ago in which two people died. They also insist they have no plans to follow their rivals - the now quiet yellow shirt protesters who helped depose the elected government of former Prime Minister Thaksin Shinawatra. It was the yellow shirts who closed the international airport for eight days in December 2008, causing huge disruption to tourists. The red shirts say they want new elections and hope to show by force of numbers alone that their cause is just. The government has promised a tough reaction if the protests turn violent. The Internal Security Act has been invoked, giving the military the power to impose curfews and restrict numbers at gatherings. Checkpoints have been set up on the roads into Bangkok. But reports from the city say that it is quiet. Small groups of protesters staged demonstrations in some key streets but later dispersed. "Today we had some small groups gathering, this is not yet a rally. We want to build sentiment before Sunday," a red shirt leader, Jatuporn Prompan, told AFP news agency. The red shirt movement, led by the United Front for Democracy against Dictatorship (UDD), has promised a huge but peaceful demonstration on Sunday. Smaller rallies, meetings and "political schools" have been planned for various provinces before convoys of vehicles carry protesters to the capital. The red shirts' last major protests, in April last year, turned violent, with two deaths and dozens of people injured. Can't count the cancellations of events for this weekend anymore. Everyone's postponing. Parties, receptions, trips, they have to wait. The Thai capital is in the grip of the red shirts without them yet being here. Parts of Bangkok will be deserted, others rather not. Read more from Thai blogs and twitter on Global Voices. "If there is a siege, we would no longer consider it a peaceful protest and immediately take steps to disperse the crowds," Deputy Prime Minister Suthep Thaugsuban said. The protest leaders say the government is playing up the threat of violence to justify a possible crackdown. The red shirts oppose the 2006 military coup that toppled Thaksin Shinawatra. 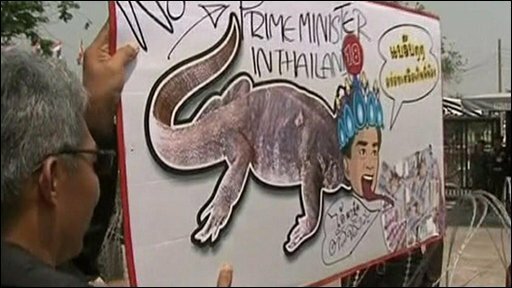 They say Prime Minister Abhisit came to power illegitimately with the backing of the military and the Bangkok-based elites. Mr Thaksin's main power base was in the rural north. He is now living in self-imposed overseas exile, after he was ousted amid allegations of corruption and abuse of power. Last month the Supreme Court ruled that just over half of the assets ($1.4bn; £910m) belonging to Mr Thaksin or his family which were frozen since the coup, should be seized.